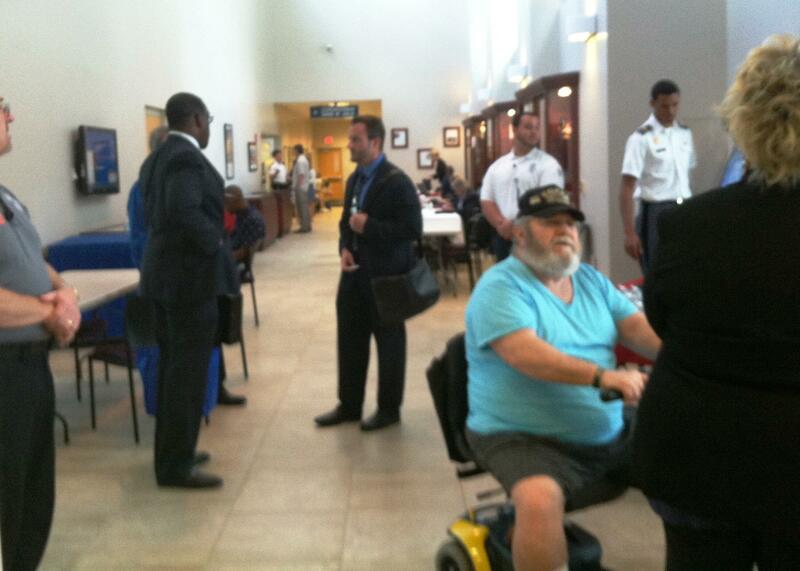 Navy veteran Robert Barrie meeting with Cong. David Jolly about getting his ship, USS NOA, on the list for exposure to Agent Orange. Barrie's notebook stuffed with documentation proving the USS NOA was exposed to Agent Orange. Vietnam veteran Al Kelly came to Jolly's office hoping to get VA care for his brother-in-law with undiagnosed PTSD from the Vietnam War. More than 180 veterans came to Jolly's Seminole office many to tell the congressman that they liked their VA health care - 68 percent rated it adequate to excellent. 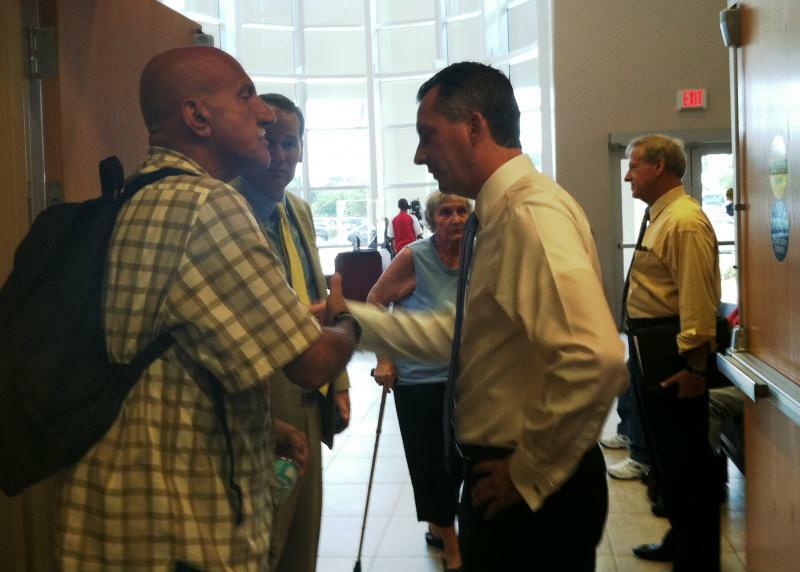 Congressman Jolly personally greeted many of the veterans as they waited in line for assistance with their VA benefits. 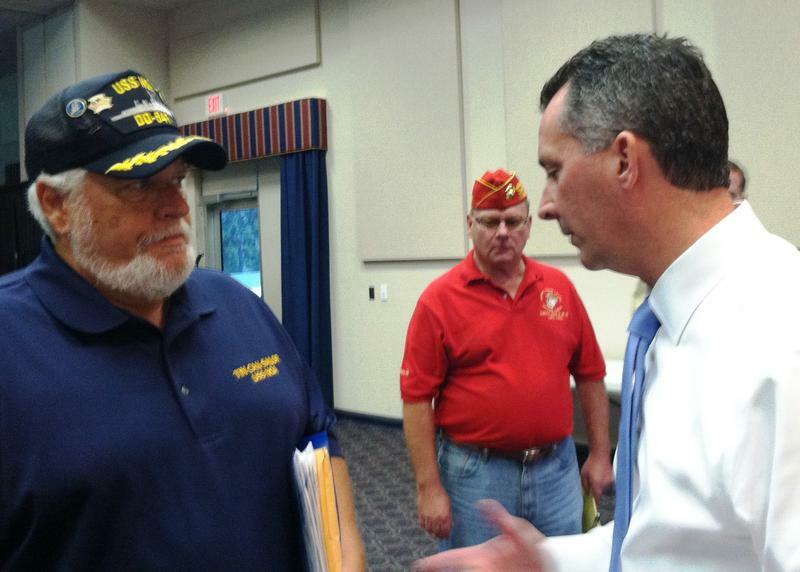 Pinellas County Congressman David Jolly asked for and got an earful from local veterans this week. He invited them to his office in Seminole where they shared stories of their experiences within the VA health care system. The veterans were offered immediate assistance from Jolly’s staff, VA representatives and volunteers from veteran service organizations. And Jolly, who serves on the House Veteran's Affairs Committee, promised to take their stories back to Washington with the aim of improving the VA system. Yet, a survey of those who stopped by Jolly’s office showed that 68 percent rated their VA care from excellent to adequate. But there were plenty of veterans who were not so pleased. Among them, two veterans looking for help – not for themselves – but for other their fellow veterans. Navy veteran Robert Barrie wore his blue polo-shirt inscribed with Tin Can Sailor – USS NOA. He’s president of the Navy Destroyer USS NOA reunion group that has more than 300 members. The congressman watched as Barrie opened a notebook filled with letters, photos and the ship’s deck log to prove his point. They are documents, Barrie said, that will qualify his crewmates for VA coverage of 15 diseases associated with Agent Orange exposure. Barrie complained the VA has repeatedly misplaced the documents and have yet to qualify the USS NOA as a “brown water” ship that cruised along the Vietnam coast and up the rivers exposing crews to Agent Orange spraying. “Have you ever used a congressional inquiry?” Jolly asked. “No. We’ve been submitting these things into the VA,” Barrie responded. “We’ll get the inquiry done in the next three to four weeks,” Jolly said. He promised to write a letter about the USS NOA directly to Acting VA Secretary Sloan Gibson in the next two week and ask that he pay specific attention to the problem. 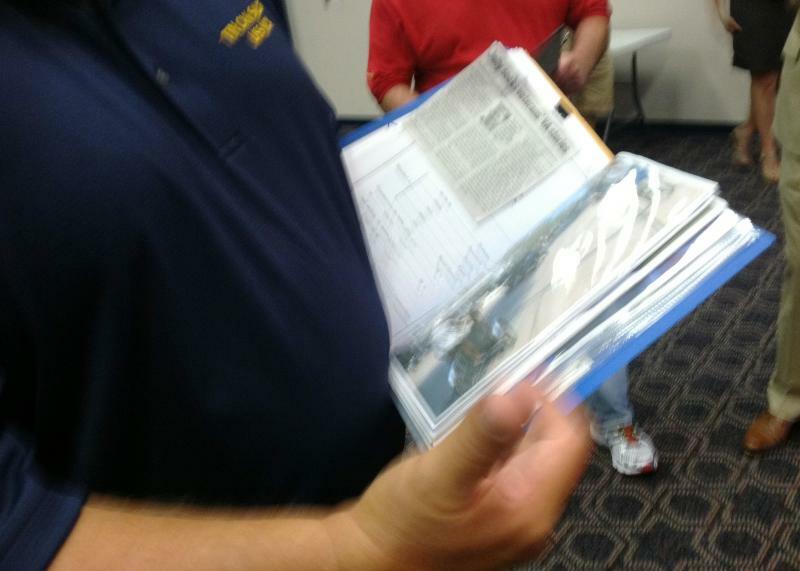 Also armed with documents, Vietnam veteran Al Kelly handed Jolly two well-worn pieces of paper – a discharge form and a citation for the Silver Star. It was not Kelly but his brother-in-law recommended for a Silver Star while in the infantry in Vietnam. He provided ground fire during an attack, while severely wounded, so his entire company could move from an open rice paddy to the cover of the woods. 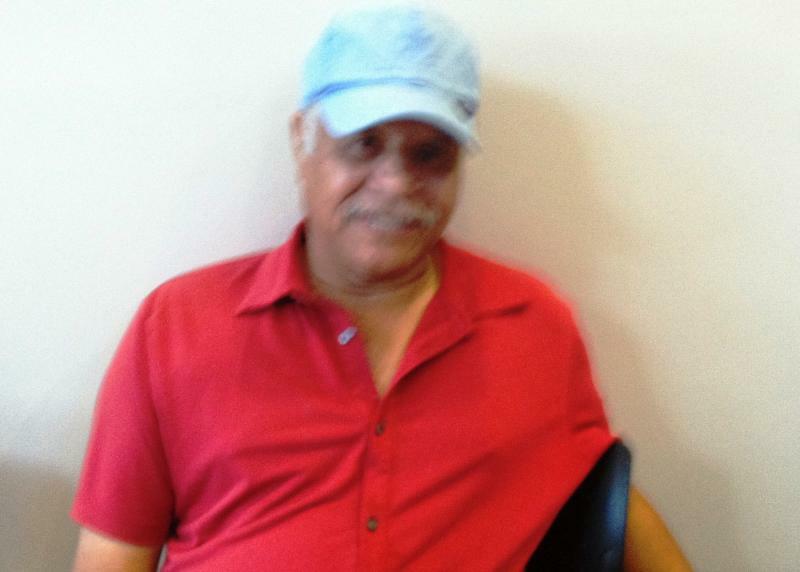 “So, when he attempted to receive care after he got out what was the experience?” Jolly asked. There was no response, no letter, no treatment, his brother-in-law never made it into the system. Six months lapsed and Kelly’s brother-in-law had an incident with a girlfriend, was charged with a parole violation and put back in prison. All Kelly wants is to make certain his brother-in-law gets treatment for his PTSD as soon as he is released from prison. And again, Jolly promised to follow up. Kelly and Barrie are no different than tens of thousands of veterans across the country – veterans watching after their fellow veterans – determined to get them the best of care. The Veterans Affairs scandal over delayed medical appointments and secret wait lists is still unfolding. And there’s been plenty of evidence that there are systemic problems at VA medical facilities throughout the U.S. Yet, even the VA’s toughest critics note that most of the VA medical staff are hardworking, dedicated professionals. 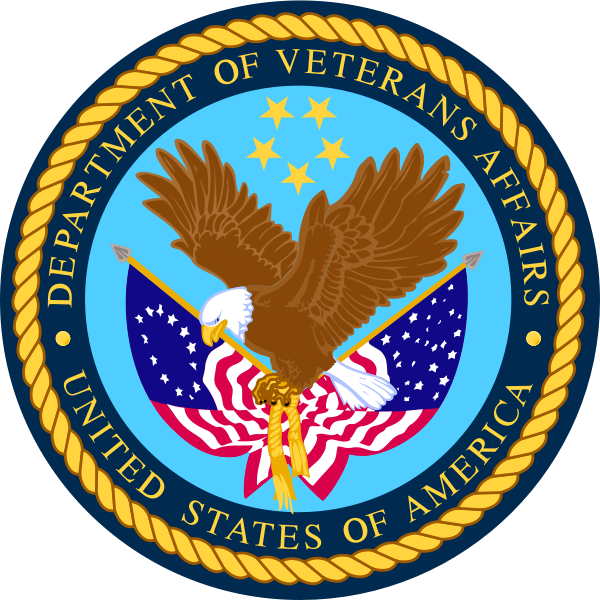 An internal audit of the 731 Department of Veterans Affairs medical centers nationwide was released today and four Florida facilities made the list requiring further review.